This Audi A7 mule was spied in Germany, but not ripping up the Nürburgring like you would expect. Rather, it was too busy bouncing off guardrails on a small country road located just off the racing circuit. It appears that the accident didn't involve any other vehicles (or any biodiesel), and the driver is said to be fine, but we can't be sure as to whether or not it was caused by a faulty component on the car or old-fashioned driver error. What is clear are the skid marks drawing a line straight into the left side guardrail— and then across the the road to the other guardrail. Looks like he must have been going pretty fast around that slippery sweeping turn. 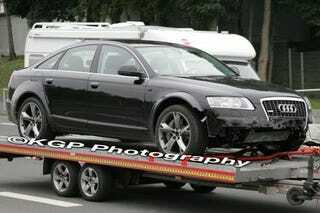 Oh well, at least Audi sent a trailer to drag it back home. The long-rumored Audi A7 is expected to be a coupe-shaped sedan, in the same vein as the Mercedes CLS. Though obviously this particular mule is based on an old tarted-up A6. We'd think that would mean mere body damage like this wouldn't be a big deal, so we're assuming more was broken here than the exterior skin.